You almost have to twist a mustachio as you read such ridiculous data. But Democrats refuse to discuss those data — refuse to say what they so plainly mean. The other side rails against Big Government. Our side is mostly silent about the Big Interests which have produced those comical data — at the people’s expense. Well, there’s a reason that data is rarely mentioned: it’s because the Democratic plans on offer right now do very little to change it. For all the sturm und drang about rationing and killing grandma and so forth, the House and Senate bills currently on the table would have a pretty modest impact on the future growth of healthcare costs. And there’s a reason for that too: the only way to cut costs is to piss off the people who benefit from those high costs: doctors, hospitals, insurance companies, device manufacturers, and big pharma — all aided and abetted by patients who never, ever want to be told no. It would be nice to think that we could enrage all these groups and still pass a healthcare bill based on sheer populist rebellion, but that’s not in the cards. It just isn’t. 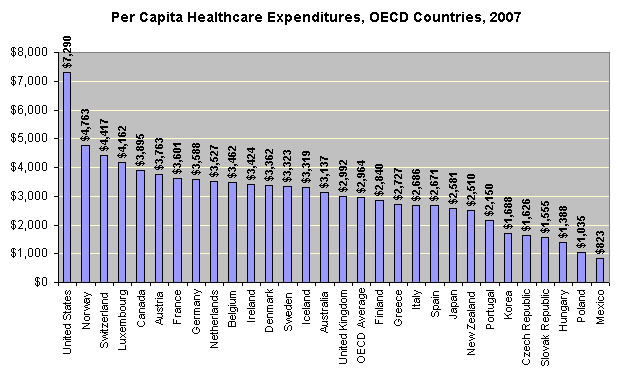 So, yeah: we spend a lot more money than other countries. Our doctors get paid a lot more. Our insurance companies have way higher administrative costs. The pill makers charge us twice as much as they charge Danes and Italians. We should have spent the last ten years filling the airwaves with this stuff. But we didn’t. Conservative were in charge of the country and we were busy with a terrorist attack, a couple of wars, endless tax cut fights, Social Security privatization, Republican scandals, warrantless wiretapping, torture in U.S. prisons, global warming, and a hundred other things. There’s only so much you can do. So now that we have a chance to do something, our only option, really, is to bribe all the special interests and try to get something passed that does about a tenth of what it should. And even at that, it’ll pass — if it passes — by the slimmest of margins. And then we go back and keep pushing. And get another tenth. And another. Because every tenth that works well makes it easier to pass the next tenth. And every tenth helps restore public faith in the ability of government to work. That won’t happen overnight, but at least Obama’s first tenth will get it started. And for those of you who want to get started now, the most recent international comparisons from the OECD are below. The United States clocks in at $7,290 per person as of 2007 (the latest data available), twice as much as nearly every other country in the world. And whether you realize it or not, that all comes out of your paycheck, one way or another. Cut the costs and your paycheck goes up.